“It’s hard to wrap your head around what a disaster this is — for people and animals"
Animal lovers across California have banded together in frantic efforts to save thousands of their four-legged loved ones threatened by wildfires raging across the state, officials said Monday. Allison Cardona, a deputy director of operations for Los Angeles County Animal Care & Control, said about 700 animals — including 550 horses, nine cows and at least one tortoise — are now in her agency’s care. But she estimated that at least 10,000 more pets have been displaced from the Woolsey and Hill Fires, both near the Ventura-Los Angeles County line, and the Camp Fire in rural Butte County, about 500 miles to the north. 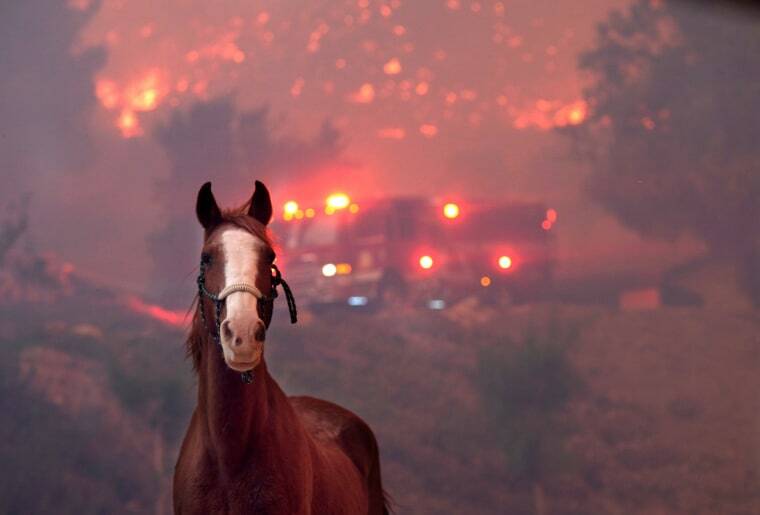 In neighboring Ventura County, public shelters there had taken in 56 horses, 30 dogs, 25 cats, seven chickens, six rabbits, four goats and a bird by late Monday morning, according to Sheila Murphy, spokeswoman for the county's health agency which oversees animal control. One of Murphy's own sons had to flee the Hill Fire in Thousand Oaks this past weekend, with two panicked dogs in tow. "The dogs were very confused and jumping around and looking at them like, `Are we OK dad?' " Murphy said. Dr. Bill Matzner, who owns eight horses and regularly boards nine, has taken in 13 more since the Woolsey Fire broke out not too far from his Simi Valley, California, ranch. With the Woolsey fire headed south and then west toward Malibu, the retired physician said he and the horses are safe for now. But if winds change directions, he and ranch hands will have to find ways to shuttle their 30 horses to safety in shifts — with just three trailers that hold a combined total of eight animals. Dan Sauvageau, a developer from Roseville, California, on Sunday raced 90 minutes north to Magalia in Butte County to help a friend evacuate his family of animals — a donkey, a cat, a dog and three goats, one them pregnant. All the animals were safely evacuated to a farm in Chico. But when locals saw Sauvageau driving a heavy-duty GMC truck and a 16-foot-long livestock trailer, they drafted him into pet-saving services. On Sunday alone, he picked up 14 more dogs and a cat in his travels, taking them to a makeshift shelter at the Chico airport. Nine of those dogs were picked up in one stop when locals told him to check out the Rosewood Drive in Magalia where he found the pack of pooches looking for help. “They all came out with a big puppy smile, happy to see us and wagging their tails,” Sauvageau said. The 39-year-old home builder had planned to go come Sunday night but struck around Butte County on Monday to help rescue more animals.